My previous forays into London’s sustainable and urban agriculture have been primarily animal based – today it’s almost entirely about the plants! 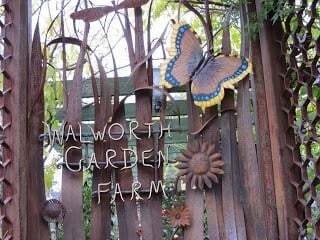 I first stumbled across Walworth Garden Farm entirely by accident on a Sunday exploratory stroll in Kennington. Kennington is an area south of the Thames that, like many of its neighboring areas, has gone through cycles of poverty and gentrification. In the 21st century it’s mostly been the later but there are still some places that have fallen into disrepair. I was actually walking past a boarded up building when I rounded the corner and came upon Walworth for the first time. A little green hideaway in the middle of a residential area! Walworth is an active charity. The land it sits on was derelict before it was claimed by local residents as a spot for horticultural education. What really sets it apart from other urban agriculture plots and sites I’ve visited is this educational emphasis. The garden farm is open to volunteers and community visitors, but one of its main purposes is to provide practical education and even employment training. With a tree festively decked out for the holidays. They hold classes on topics ranging from introductions to gardening to beekeeping (there are hives on site), and partner with schools, other charities, wildlife clubs, and youth groups. One of the main organizers I spoke to also talked about her work with a number of groups for people with disabilities who use gardening for exercise and therapy. Another of their classes aims to provide individuals with certified horticultural work experience, and even offers assistance to help participants craft a resume, develop their interview skills, and find employment. They even help with literacy and numeracy skills if you need them for any reason! 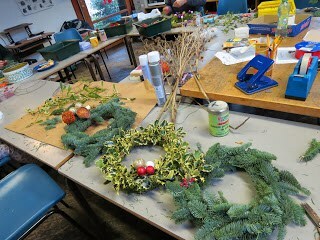 On the day of my visit, I was invited to help other gathered visitors and volunteers craft holiday wreaths, centerpieces and ornaments to be sold to raise money for the garden farm’s maintenance. Our materials were natural and gathered from the garden itself. This was my first time attempting anything crafty in a long while and though my first attempt didn’t impress me, I was able to donate three wreaths to the cause. It was a bit bare, since my visit was in December, but for a single plot of land I thought it was well planned! There were multiple greenhouses for nurturing growth and winter preservation, edible and ornamental plants, and even a water garden. And in the true style of proper English gardens, everything had its own specified place, but managed to look melded together very well. I imagine that in summer it must look splendid, and I definitely plan on coming back to see it in full bloom. 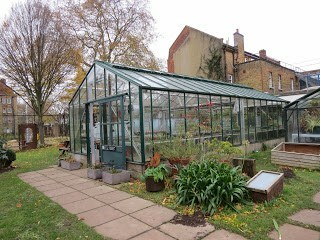 Walworth Garden Farm is another example to me of how proactive agricultural space is in London. 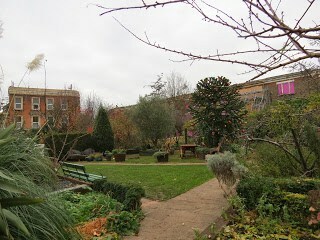 There are plenty of parks and gardens that are maintained for beauty, recreation, and public enjoyment (Britain is in many ways very protective of park and natural spaces in cities, although urban spread is a problem), but I have yet to come to an urban agricultural space that does not serve several additional purposes to the community. I’m really impressed at Walworth’s success at joining locally grown food and green initiatives with educational and employment programs. And I would love to see more programs like it in the US. Sound off in the comments. Do you have anything similar in your area? Would you like to see an organization like this in your town? Or, on the other hand, do you think initiatives like this wouldn’t work in your area and why not?